Week Nine! Halfway through the CSA Season. 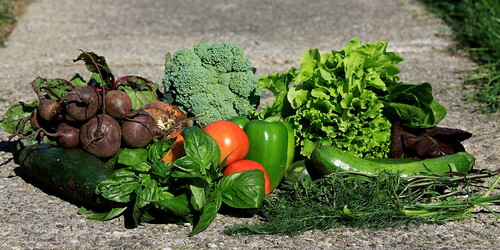 :( That means only 9 more weeks of lovely, organic fruits and veggies provided by local farmers. Looking at their website, I am seriously considering the winter share. So, plans for the week. It's nice to be back on and have plans *before* I use these things. Cucumber: Well, there are always pickle options. I need to put up more Bread-n-Butter pickles and probably should do some Icicle pickles. So, if Dad brings more, then there will be pickles. If not, I am craving an Asian style cucumber salad with really sliced thin cucumber noodles. Beets: A while ago when I had beets I said I was going to do Beet Tzatziki. But I didn't. So I am planning on doing that tomorrow. I am looking forward to eating it on pita chips. Broccoli: Another thing coming out my ears. Steamed. Zucchini: I am definitely in for this summer vegetable pizza. Maybe with sausage. Muskmelon/Cantaloupe: Cut it up and bring it for lunch. Yum. I think I remember this being my favorite melon when I was little, but I could be wrong. I still really enjoy it. Red Plums: I am not sure on this one. They are not very sweet, so I shall consult some recipes. Maybe some sort of plum butter? 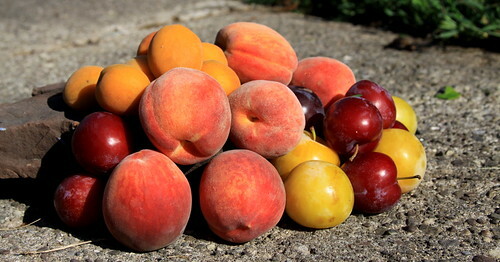 Nectarines: I have already eaten 2 since they were really ripe ones. Sprinkled with a little sugar and a little chocolate soy milk. Delicious. I don't know how I've gotten so behind in this. That's not entirely true...I participated in Bread and Water Theatre's Annual Art & Music Fair and the experience kind of exhausted me. And disappointed me. I got some wonderful feedback from kind customers - most notably the backhanded compliment that my photo cards are too lovely for mail. Maybe some prints I guess? I don't know, the public is fickle. Anywho, Week 8 began the Fruit Share! For this purpose, I am not going to separate out in pictures, what is from what share, but will note with *fruit share item*. And, since it was the start of the fruit share, I put most of the fruit together in another picture, with the exception of the early apples. 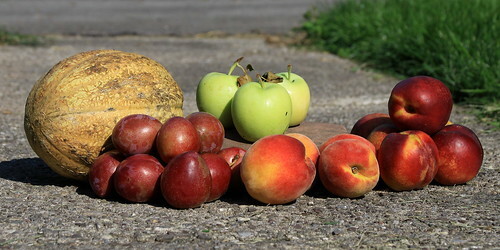 I just couldn't resist the yellow apples against the green and brown of my photo prop. Yes, I am getting so much I am needing to elevate things to get them all in the picture! Look at how lovely those reds, oranges and yellows look together! Yum! Apricots: The minute I saw these, I thought tart. I am not sure why, but I was. So, I ended up making an apricot-plum tart over almond-honey marscapone cheese. With the leftovers, I am thinking about cooking them down and putting them over french toast. Yellow Plums: These did not last long! They were like honey wrapped in a lovely, soft flesh! Red Plums: I was expecting sweet plums, but these are a little more sour than I expected. I used these by eating them in lunches and in the above mentioned yummy tart. Red Raspberries: I ate them. In one handful. Basil & Dill: I've been keeping the cut herbs in water by the window. The basil keeps much better than the dill and is an easy quick addition to almost anything! Broccoli: Stir-fry, salads and steamed. The 3-S's of Summer Eating! Carrots: I enjoy carrots, just not like I used to. I can't eat them raw like I used to before this crown. :-\ What doesn't get used early will be cooked and used for stock. I have some summer squash I should cook down too. Corn: Cooked, grilled, eaten. I am thinking about cornbread too if it doesn't get eaten right off the bat. Chard: I am officially tired of chard. Anyone ever use it in vegetable stock? Green Beans: Stir-fry and steamed. I steam mine with a little olive oil, rosemary and garlic salt, yum. Wow. That was a lot. And, onto Week 9! Zucchini: Will be ground up in the meat grinder and frozen somehow and stored for future projects. May save one or two of these for slicing thin for a salad/pasta type side dish. My Dad dropped off a bag of zucchini/summer squash so I need to store it somehow. Cucumbers: Went in the pickles I discussed in Week Six. Dill Sandwich Slices. Yum. Broccoli & Cabbage: Looking at these two, I am totally feeling another stir-fry. I really enjoy homemade stir-fry, if you can't already tell. Scallions: The scallions from Week 4 are still going strong in a vase with water. These will join them. I've been slowly adding them to things when I think of it. Kale: Since this is the dragon variety, it doesn't make kale chips well. So, I will be sauteing it and doing greens-n-beans to serve with hamburgers en croute later this week. I think I may document that process, so if it goes well I can share it with you all. I have high expectations since I couldn't really find the recipe I wanted online at all. Dill & Basil: Are currently sitting in a glass trying to perk up. That is one of the downsides of cut herbs, they dry out quick. I'll use them throughout this week and see how they hold up. Peaches: They will just get packed in lunches. Peaches are one of my favorite fruits (I say that about *a lot* of fruit! I was in Texas. 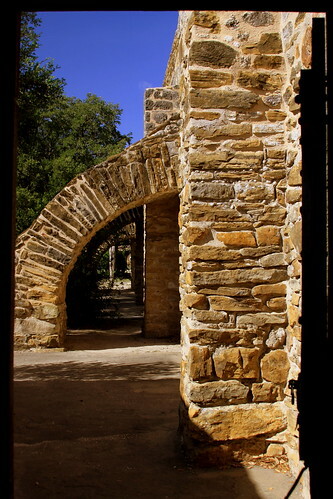 The above is a picture I took at Mission San Jose. The rest of my pictures, including many of some elusive peacocks can be seen in my Flickr set. Texas was HOT - 103-105 every day! But, it was fairly dry and it was *very* nice to get away for a bit before the school year starts. 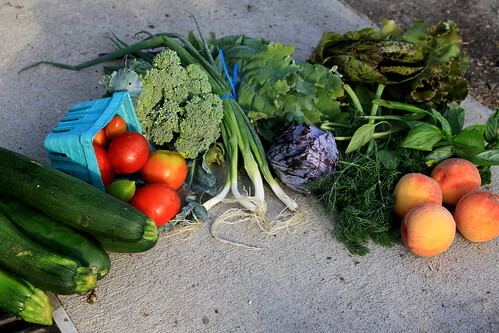 So, Week 5 was picked up and consumed by my dear friends Val and Brian, who belong to the same CSA. And, since I am late in posting, I will just let you know what I ended up doing with all these yummy veggies! Cucumbers & Dill: My Dad had already dropped off a bag full of cucumbers, so I knew what I was going to do with them - make some dill sandwich slices. And I did. Mind you, I almost needed stitches as well. There is a reason my middle name is not Grace - that is for sure! *Tip for using your mandoline*: Use the holder thing and cut the ends off your cucumbers before slicing them, it works so much better that way! Apricots: I still have the apricots, and I am still thinking a tart of some sort. Val and Brian saved our cherries from Week 5, so I am thinking an apricot cherry tart. What do you think? Blueberries & Zucchini: I ended up making Zucchini Bread with Blueberries and Mini Chocolate Chips. It was delicious! There was a handful of berries left and they went in smoothies. Corn: Most of the ears were eaten grilled with some Parmesan cheese, salt, pepper and served with some grilled shrimp. There are two left for later consumption.